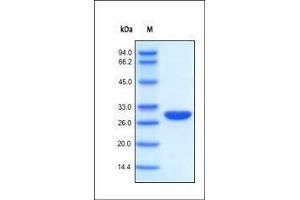 The purity of BenzNuclease was determined by SDS-PAGE reduced and staining overnight with Coomassie Blue. Specificity One unit will digest sonicated salmon sperm DNA to acid-soluble oligonucleotides equivalent to a ΔA260 of 1.0 in 30 min at pH 8.0 at 37 ℃, which corresponds approximately to complete digestion of 37 μg DNA. Note that 1 KU=1000 units. Application Notes Its high intrinsic activity and broad substrate tolerance make the endonuclease an ideal tool in a variety of biotechnological and pharmaceutical applications: removal of nucleic acid from protein samples (Elimination of nucleic acids from recombinant proteins, Purification of protein fragments from inclusion bodies, Sample preparation in western blotting or twodimensional gel electrophoresis), Viscosity reduction in protein extracts. DNA Substrate: 1 mg/ml salmon sperm DNA is dissolved overnight at 4 ℃, in reaction buffer, and is then sonicated on ice to obtain a homogenous solution. Measurement of activity: The activity of any unknown nuclease can be determined from a single measurement by means of the standard curve. The specific activity of BenzNuclease is >1.5 x 10 e6 unit/mg protein. - Incubate the mixture at 37℃ for 30 min. - Stop the reaction by addition of 400 μl cold TCA and incubate on ice for 10 min. - Centrifuge at 8500 g for 5 min. - Measure the absorbance of supernatant at 260 nm. - Lot a standard curve with nuclease of known activities for each set of measurements. Reconstitution Please see Certificate of Analysis for specific instructions. For best performance, we strongly recommend you to follow the reconstitution protocol provided in the CoA. Storage Comment No activity loss was observed after storage at: In lyophilized state for 1 year (4 °C), After reconstitution under sterile conditions for 3 months (-70 °C).